Hope`s relief cleansing bar is a soap free alternative suitable for people prone to dry, itchy skin and sensitive skin conditions. It is gentle enough to use on the face and bodies of babies, infants, children and adults. The cleansing bar is 100% free from perfumes, sodium laurel sulphate and artificial colours. It is also balanced to pH 5.5 (the same as skin) to help maintain moisture and the skins natural oils. This soap free cleansing bar is enriched with 3 active herbal ingredients, caledula, manuka honey and Aloe Vera. What does `Soap Free` mean? This cleaning bar is pH balanced to the skin, no fragrances, no chemicals, no irritation so moisture and oils aren`t stripped from the skin. This bar helps to soothe, moisturise and relieve itchy, dry skin. Why is the pH 5.5 important? Normal skin has the correct balance of moisture and oils, and is slightly acidic at 5.5 - 5.75pH. Most soaps have a pH of 7 - 12 which can damage the skin barrier function. This soap free bar is balanced at 5.5pH, the same as skin to help maintain moisture and oils. Calendula officinalis flower extract (calendula), Lepospermum scoparium mel (Manuka honey), Aloe Barbadensis (Aloe Vera), Sodium Cocoyl Isethionate, Disodium Lauryl Sulfosuccinate, Zea Mays (Corn) Starch, Glycerin, Aqua (purified water), Cetearyl alcohol, Ricinus Communis Seed Oil, Lactic Acid, Coco Betane. 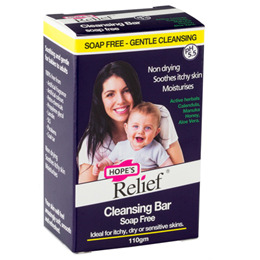 Below are reviews of Hope`s Relief Soap Free Cleansing Bar - 110g by bodykind customers. If you have tried this product we'd love to hear what you think so please leave a review.